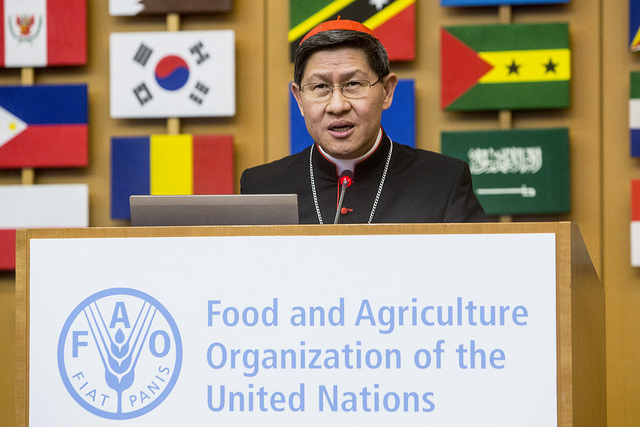 Caritas president Cardinal Luis Antonio Tagle has said that the issue of food loss needs to be looked at differently and approached through government policy, lifestyle choices and spirituality. The Cardinal was speaking at the event ‘Practical Approaches for Reducing Food Losses in the Context of Food Security: A Challenge for the International Community’ at the United Nations Food and Agriculture Organization (FAO) headquarters in Rome. Up to a third (1.3 billion tonnes) of all food is spoiled or squandered before it is consumed by people every year. Food is lost or wasted throughout the supply chain, from initial production to when it reaches people’s homes. This has a massive impact on poor families who rely directly on agriculture for their food. During his speech, Cardinal Tagle said, “ If we want food systems to ensure the right to adequate food for everyone, including the most disadvantaged ones, this requires sound policies and effective measures to prevent food losses. The Cardinal said that food loss is a problem in the implementation of Caritas’ projects. He gave examples of Caritas’ work to reduce food loss including the “Farm for Maine” programme in the USA which distributes food straight from the field to needy people and a 2014 study by Caritas Malawi which showed how food losses from numerous crops impacted small farmers. For more information, please contact Michelle Hough on +39 06 69879712 / +39 334 2344136 or hough@caritas.va.